Intended for evangelical Christian Camps, How to Be a Successful Camp Counselor isn’t stuffed with useless puff and theory. 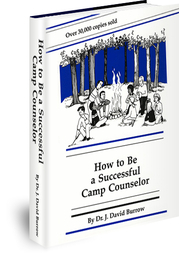 It’s an easy-to-read, easy-to-follow, practical book that fully equips even novice counselors to professionally handle everyday camp problems. Make friends with campers––on the first day. Discipline––without yelling, torture, or ridicule. Enforce “problem preventing” cabin rules––without being a bully. Be a friend––without sacrificing authority. Get kids to “open up” in a discussion––and exactly what to do when you can’t get a discussion going. Stop after-dark bathroom visits––without creating a problem. Get campers to sleep in about 15 minutes––every night. Stop a bully in his tracks––without being one yourself. Conduct a successful story time––without being boring. Measure success––using a 16-point checklist. Set goals and why they work. Work like part of a team. Have a safe and successful cookout. Recognize the different camper personality types. File campers using birth order, family, and culture. To a homesick camper––and what not to say. To get kids excited about their coming week at camp. When you want to find out where the camper is coming from––20 specific questions to ask. About child abuse––including 10 common symptoms of sexual abuse. When you’re abused by a camper. When a counselor falls in love at camp. With the camper who insists on calling home. Chapter 4 helps your counselors actually measure their spiritual success with campers. Chapter 10 simplifies how to lead a child to Christ. Chapter 18 gives specific helps on how to end camp on a spiritual high instead of a worldly blowout. Chapters 14 & 15 detail how to lead a discussion. These simple but valuable practical suggestions can mean your campers will have their lives challenged for Jesus Christ. Great memories will draw campers back year after year. “I found it to be a practical book for myself as a Director of a camp, and I’m convinced it would be a valuable book for the counseling staff, as well. I am interested in purchasing 30 copies of this book to give to our summer staff that have direct interaction with campers.